Arapaho National Recreation Area is administered by the US Forest Service rather than the National Park Service, but like most other NRAs it is centered around an artificial lake, or rather lakes - five of them in all, near the far upper end of the Colorado River, adjacent to the west edge of Rocky Mountain National Park. 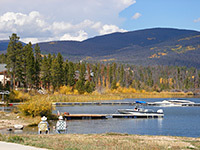 The two main lakes (Shadow Mountain and Granby) are large and scenic, backed by 12,000 foot mountains to the north and east, though most of the accessible parts of the shoreline (alongside highway US 34) are quite heavily developed, lined with many lodges and holiday homes, plus assorted shops, campsites, marinas and picnic sites. The other three (Willow Creek Reservoir, Monarch Lake and Meadow Creek Reservoir) are smaller, more remote and much less visited, but despite the busy surroundings of the two larger lakes, there are still some quiet, tranquil spots along the water's edge, while the far (east) sides are completely unspoilt, albeit rather inaccessible owing to the steep mountains beyond. 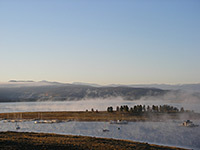 The principal town in the area is Grand Lake, a commercially-oriented place filled with a mixture of exclusive dwellings and tourist shops, built on the edge of its namesake lake (just outside the NRA), though offering only limited shoreline access. Similarly sized Granby, 15 miles south, is a more traditional Rocky Mountain town, and provides all necessary facilities. After exiting Rocky Mountain National Park, the Colorado River first flows into Shadow Mountain Lake then, after a few miles of short but narrow canyon, meets the much larger Lake Granby (see map). These are just the first two of six reservoirs on the river's 1,450 mile journey from the mountains to the Sea of Cortez (the others being Lake Powell, Lake Mead, Lake Mohave and Lake Havasu). 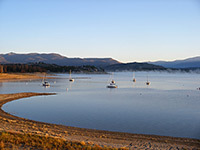 Granby has two centers for visitor activities; one is at Stillwater, a peninsula near the north end of the lake, where facilities comprise a boat launch, picnic area and campground/RV site (with full hookups). About half the 129 spaces overlook the water, and the place is quite pleasant. Like all such lakeside access points a fee is charged even for day use (2009 rate: $5 per vehicle per day, paid via self-service fee stations). The second location is Sunset Point (camping, boat launch, picnic site), built on a slightly larger and less completely-developed promontory on the south shore of the lake, though one that also has a few private residences. Past these the road becomes unpaved and crosses Granby Dam, where the Colorado River exits the lake into quite a deep valley, then continues all the way along the southeast shoreline to several primitive campsites, a trailhead (Roaring Fork) and one of the smaller lakes (Monarch). For free camping near the NRA, the best place is in the Arapaho National Forest to the west, and the quickest access is along Suckers Lane, which forks off US 34 opposite Cutthroat Bay, right at the top of Lake Granby; this crosses the USFS boundary after 2 miles then passes many side tracks and clearings in the forest, some allowing distant views down to the lakes. Shadow Mountain is one fifth the size of Granby, and less visible since although US 34 runs along all of the west shore, it is separated from the water by a line of houses, some quite large and shaded by trees. But near the south end two roads do provide some access - one to a picnic area (Pine Beach), on an empty, partly wooded peninsula, the other to various sites along the south shore including another picnic area, a boat launch, a 78-site campground (Green Ridge), Shadow Mountain Dam, and the East Shore Trailhead; from here begins a 3.5 mile path along the far side of the lake, meeting a road again at the edge of the suburbs of Grand Lake. There are several other trailheads in or near the NRA (East Inlet, Kawuneeche, North Inlet, Tonahutu), from where begin long hikes into Rocky Mountain National Park - see the west-side hiking index for details.